The original film with the title Inglorious Bastards is an awesomely bad Italian "men on a mission" B-movie from the 1970s, starring Fred "The Hammer" Williamson, as a member of a rogue squadron of American troops stealing Nazi technology, deep inside enemy territory. The action sequences are reminiscent of the bloody slow-mo mayhem of Sam Pekinpah's Cross of Iron and the goofy plot is similar to Clint Eastwood's WWII caper flick, Kelly's Heroes. 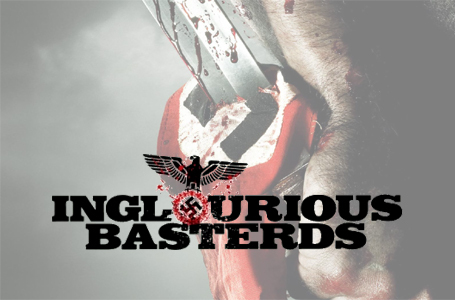 Quentin Tarantino's affection for Inglorious Bastards led him to borrow the name (with a slightly altered spelling) for his own WWII "men on a mission" flick, Inglourious Basterds. Tarantino's fairytale of WWII begins in black with the words: "Once upon a time in� Nazi-occupied France" scrawled across the screen. Viewers are then treated to a gorgeous rural farmhouse setting reminiscent of the idyllic opening scenes of The Princess Bride - with a farmer and his daughters working outside their country cottage. The serenity is quickly shattered by a visual and musical nod to Sergio Leone's Spaghetti Western masterpiece, Once Upon A Time In The West, as Nazis roll up to the farm in a dusty cloud of motorcycles and noise. 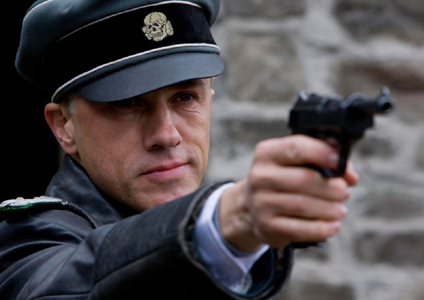 Another similarity to Leone's masterwork is drawn with the introduction of Hans Landa (Christoph Waltz), a Nazi officer known as "The Jew Hunter" for his skill at finding and capturing Jews hiding throughout German-occupied territory. The character of Landa is quite similar to Henry Fonda's Frank from Once Upon A Time In The West - someone whose outward appearance belies the demon beneath. Every moment Landa is on screen is spellbinding due to Waltz's Oscar-worthy performance. Unlike Fonda's Frank, Landa is a charmer who jovially talks his way into every situation and whose skill at uncovering the truth is so keen that viewers instantly pity anyone forced to match wits with him. 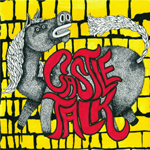 As Landa introduces himself and is invited inside for a quiet discussion it becomes apparent that the farmer is harboring the Dreyfus family, Jews from a nearby farm. Needless to say things do not turn out well for the hidden refugees. The horror of the opening scene is followed by the introduction of the squadron of American troops soon to be known as "The Bastards." 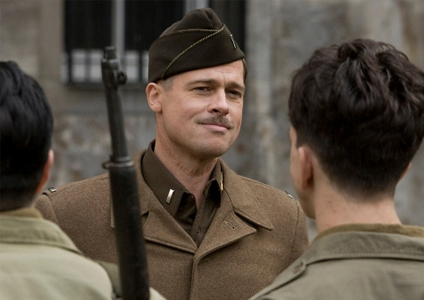 This elite troop, made up entirely of Jews and lead by Brad Pitt's hilarious and captivating Lieutenant Aldo Raine, have one mission: to kill and maim as many German soldiers as possible in order to strike fear into the hearts of Axis troops. While there are very few moments showing The Bastards in action throughout the course of the film, the brief glimpses of their handiwork are thrilling and shocking. 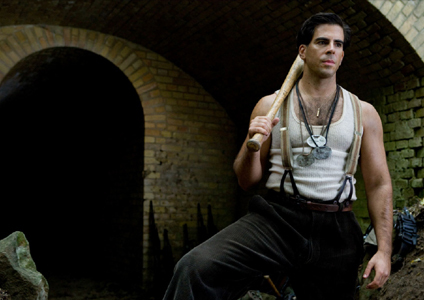 The introductions of ex-German soldier Hugo Stiglitz and Donny "The Bear Jew" Donowitz (played by director Eli Roth) are both worth the price of admission to the film alone. Not being in the business of taking prisoners, The Bastards are savage toward any German soldier they come across. The Bastards desecrate the dead while leaving only a scant few behind - forcing them to betray their brethren's strategic locations and then to aid in spreading the legend of The Bastards throughout the German ranks. 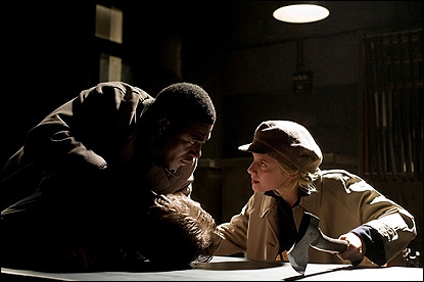 Sadly, the scenes of The Bastards in action are few and far between because the majority of Inglourious Basterds' run time is consumed by another equally captivating tale, that of Shoshanna Dreyfus. The lone survivor of the Dreyfus family massacre, Shoshanna is suddenly and unexpectedly presented with an opportunity to exact revenge upon the very members of the Nazi party who authorized the hunting and execution of all Jews throughout Europe. 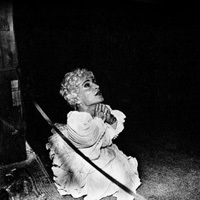 Shoshanna, years after the slaying of her entire family, is hiding in Paris under the alias of Emmanuelle Mimieux, the owner of a small movie theater. Per the order of Nazi Minister of Propaganda, Joseph Goebbels, all cinemas were forced to show Nazi-centric films made by Hitler's favorite director and starlet Leni Riefenstahl and even by Goebbels, himself. Shoshanna suddenly finds herself host to the premiere of Goebbels' latest film, Nation's Pride, about a young Nazi sniper who kills hundreds of Allied soldiers while surviving a three-day siege. Shoshanna and her boyfriend Marcel concoct a plan to turn the premiere of Nation's Pride into a mass assassination of all attending Nazi Party officials. At the same time Shoshanna and Marcel are setting their plan into motion, the Allies begin staging a plot, involving The Bastards, dubbed "Operation Kino," which has the same goal of eliminating a large group of enemy leaders congregating in one location - Shoshanna's theater. Tarantino cranks up the tension as both plans are set in motion; though they run simultaneously and seek the same morbid end through the same brutal means, both parties are completely unaware of the others' plot. 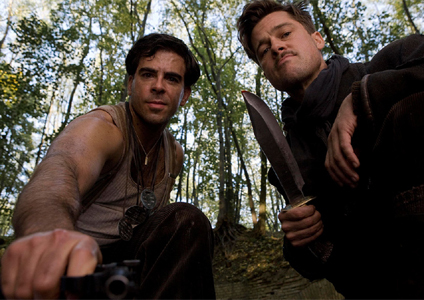 The conclusion of Inglourious Basterds is an entertaining, albeit violent, fantasy replete with a montage featuring an oddly appropriate David Bowie song, some hilarious Italian accents, and more bullets, dynamite and right-wing nuts than an NRA convention. Tarantino serves up reference after reference - nodding to classic war films like The Big Red One in the same moment he is channeling 1984, Scarface and Sergei Eisenstein's propaganda classic, Battleship Potemkin. Similar to hip-hop, Tarantino "samples" camera shots, plot devices and character names from his favorite films and fleshes it out with his own always-snappy dialog. The result is stunning. There is occasionally a difficult dichotomy between the satirical aspects of the film, such as Brad Pitt's ridiculously fun Tennessee accent and the harsher moments of the film like the massacre of the Dreyfus family. Given that the film begins with the words: "Once upon a time�" those horrific moments are not dissimilar to the horrors set in any fairy tale. The cannibalistic witch kidnapping Hansel and Gretel is not completely of a different spirit than the chilly brutality of Hans Landa mowing down the Dreyfus family with machine guns. The main point of Inglourious Basterds is revenge - revenge for wrongs committed by the Nazis, revenge for years of scapegoating, exile and oppression of Jews and revenge for the cinematic tradition of portraying Jews as victims in WWII movies. Through his fantastic vision Tarantino is able to right all of these wrongs, particularly in regard to ending the cinematic tradition of Jews as helpless victims. From the pack of tough American and German-born Jews in the Basterds squadron to the stoic but brooding Shoshanna Dreyfus, the Jewish characters in the film are complex, strong and dynamic people. Their reaction to the slaughter of friends and family, at the hands of the Nazis, is savage, and in Quentin Tarantino's fantasy world, completely justified in its ferocity. Inglourious Basterds is yet another gem in Quentin Tarantino's canon. His ability to masterfully craft movies that are equally pop-lite and artistically sound is unparalleled, and those interested in seeing an entertaining and compelling film won't go wrong here. Inglourious Basterds is truly a celebration of the creative joy and raw power of cinema.